Encouraging pure comfort; the Hampton Wicker Outdoor Chair in Pebble colour, marries old world glamour with modern tones with its airy, dignified and charismatic design. Our glamorous Hampton Collection is reminiscent of old fashioned grand estates and seaside resorts in Europe. Though a classic framework is the basis for this design, the Hampton Collection is modernized by the implementation of soft pastel, luxurious fabrics and materials. We achieve this opulence with an intricate diamond shaped weave of Viro® wicker, the leader in outdoor wicker fibre, and pillowed with soft pastel grey Sunbrella® cushions, filled with long lasting Quick Dry foam so you know that you have a quality piece of furniture completely suitable for outdoors to be enjoyed for years and years to come!!! Want to create a space for you and a partner to bask in comfort as you watch the sunset? Place two Hampton Wicker Outdoor Chairs facing your view with a Hampton Lamp Table in between; the perfect spot to sip wine and enjoy the company of your loved one. Or add to your entertaining area! 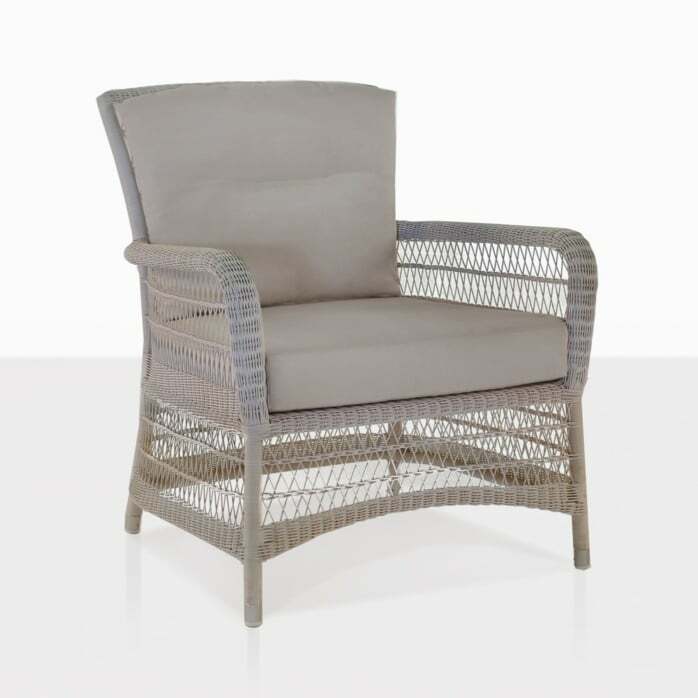 Place a Pebble coloured Hampton wicker outdoor chair on either side of a Hampton Sofa for a marvelous, whimsical, welcoming seating arrangement.